The countdown to the fifth annual Park City Food & Wine Classic is on. This year’s PC Food & Wine Classic takes place from July 9-12. It’s an extravaganza of food and drink that will feature world-class chefs, food and wine seminars, gourmet dinners, wine tastings and pairings, and more the 500 different wines. The Park City Food & Wine Classic is also an opportunity to meet with winery owners and winemakers from around the world, all within the gorgeous summertime setting that is Park City. According to Food & Wine Classic producer Doug Larson, there’s something for everyone at this year’s event: “Whether you are new to wine or an oenophile, you are guaranteed to find something to your liking at the fifth annual Park City Food & Wine Classic.” This year’s featured events include “A Toast to Remember” kickoff celebration at Park City’s High West Distillery on Thursday, which includes live entertainment and an auction for the Alzheimer’s Association. Friday’s main event is the “Stroll of Park City Grand Tasting,” where attendees will enjoy an afternoon of food, wine and spirits at various Main Street locations in Park City. Also on Friday is the annual Park City Food & Wine Classic Golf Tournament. Then on Saturday, the Food & Wine Classic concludes with the popular “Toast of Park City Grand Tasting” at The Canyons Resort. The Canyons’ Grand Tasting will feature more than 500 wines from around the globe and food from two dozen participating restaurants, along with cooking demonstrations by talented chefs. Throughout the Park City Food & Wine Classic, festival patrons also will have the opportunity to attend education seminars, organized wine tastings and private wine dinners. 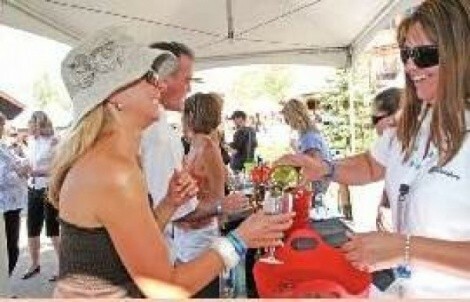 For more information, event details, and tickets go to ParkCityFoodAndWineClassic.com or phone 877-328-2783.